Showing results for tags 'bugfix'. 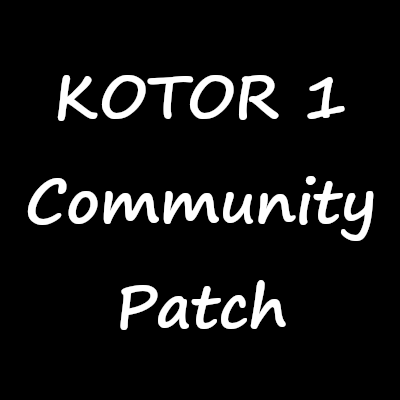 ======================================================== KOTOR 1 Community Patch ======================================================== Maintainer: A Future Pilot Contact: afuturepilotis@gmail.com or PM at deadlystream.com Original Release Date: 04/17/2018 Note: To be compatible with K1R, you must install this AFTER you install K1R. Please report any bugs you encounter. Hotfixes (If you encounter these bugs from earlier versions of the K1CP, follow these instructions): Unable to leave the Kashyyyk Shadowlands or Rulan doesn't spawn - copy k_pkas24aa_enter.ncs from the tslpatchdata folder of the latest version to your Override folder. One of the Mercenaries on Manaan's dialog freezes - copy man26_irimerc.dlg from the tslpatchdata folder of the latest version to your Override folder. Bastila isn't redeemable on the Star Forge - delete sta_m45ac.mod from the Modules folder, then run the latest version of the K1CP installer again (This assumes no other mods have edited sta_m45ac.mod). You will have to load a save from before you entered this level of the Star Forge. 1. 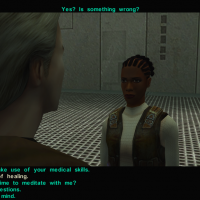 Description: ---------- This mod is a compilation of various bugfix mods (as well as a few original fixes) put together with the intention of fixing all the known bugs with the last official patch of KOTOR 1. A huge thanks to all of the mod authors who created these mods, and gave me permission to include them in this patch. 2. Install: ---------- To install, run Install.exe and select Part 1. Once it finishes re-run Install.exe and select Part 2. Unless a mod specifically says otherwise, install this after everything else 3. List of included mods and fixes (alphabetical by author): ---------- A Future Pilot: Respawn tach gland in chest on Kashyyk if player has received quest from Griff Juhani wouldn't spawn in the post-Leviathan scene (Fix found by Kexikus, implemented by AFP) Griff sometimes wouldn't spawn in the Sand People Enclave Infected Republic Soldier on Taris wears a combat suit (Reported by Mr Ardvark) Dune sea miners on Tatooine aren't wearing Czerka gear (Reported by Mr Ardvark) Belaya attacks with her fists (Reported by Mr Ardvark) Removed Dark Jedi Corpse from Hrakert Rift Station, and moved his inventory to a chest in the Sith Embassy (Reported by Mr Ardvark) Shaardan attacks with a sword (Reported by Mr Ardvark) Czerka Employees on Korriban wear Sith gear (Reported by Mr Ardvark) Mission has no clothes on when talking with Griff in the spaceport without her in your party One of the boxes in the Rakatan Temple is inaccessible Gana Levin's appearance changes and her text dialog doesn't appear It's possible to get infinite LS points in a conversation loop with Worronzor Various Sith Trooper appearances are incorrect (some Sith are set to be troopers when they should be officers, or vice-versa) Calo Nord has different stats/items on different planets Several droids have the wrong sound set in Davik's Estate Yuthura doesn't equip both her lightsabers when attacking blennus: The XP reward for delivering the box to Motta the Hutt was incorrect: The Comprehensive KOTOR Bug Fix Collection Tanis' dialogue on Tatooine was bugged when playing as a female: The Comprehensive KOTOR Bug Fix Collection Bacca's Blade Hilt script would sometimes not allow you to receive it: The Comprehensive KOTOR Bug Fix Collection Bacca's Blade Hilt was never removed from your inventory: The Comprehensive KOTOR Bug Fix Collection Elora confesses to Sunry's infedelity automatically if you have Jolee or Bastila in your party: The Comprehensive KOTOR Bug Fix Collection If you force persuaded Ignus, he wouldn't testify on your behalf: The Comprehensive KOTOR Bug Fix Collection The Iridorian's dialog script would stop you in the middle of the dialog choice: The Comprehensive KOTOR Bug Fix Collection The security camera dialog on Manaan was extremely annoying: The Comprehensive KOTOR Bug Fix Collection Once Xor appeared, no other messengers could appear: The Comprehensive KOTOR Bug Fix Collection If the prisoner in the Sith Academy was interrogated multiple times rapidly, the animation would loop for a long time: The Comprehensive KOTOR Bug Fix Collection Sith Apprenteces has their soundsets mismatched: The Comprehensive KOTOR Bug Fix Collection Sometimes the wrong dialog would play during the Leviathan torture scene: The Comprehensive KOTOR Bug Fix Collection On board the Yavin Station, when the Trandoshans appear for the first time, some of the dialog options sometimes causes you to be kicked out of the dialog: The Comprehensive KOTOR Bug Fix Collection danil-ch: Some DS responses were unavailable in k_hcar_dialog.dlg: KOTOR Bug Fix Attempt 1.1 Calo Nord’s soundset was broken: KOTOR Bug Fix Attempt 1.1 Some of Bastila's lines regarding her father's holocron were unavailable: KOTOR Bug Fix Attempt 1.1 Some camera angles were wrong during the Leviathan interrogation: KOTOR Bug Fix Attempt 1.1 Bastilla turned off her lightsaber after the Revelation cutscene: KOTOR Bug Fix Attempt 1.1 Bastila and Carth were positioned wrong after the Revelation cutscene: KOTOR Bug Fix Attempt 1.1 Malak's grunt sound didn't play in the Revelation cutscene: KOTOR Bug Fix Attempt 1.1 The pause animation on the Star Forge when confronting Bastila had the wrong participant: KOTOR Bug Fix Attempt 1.1 On the Star Forge, the wrong speaker said the "You are wasting your time..." line: KOTOR Bug Fix Attempt 1.1 Several camera angles on the Star Forge were inconsistent: KOTOR Bug Fix Attempt 1.1 One of Juhani's lines was inaccessible: KOTOR Bug Fix Attempt 1.1 darthbdaman: Mandalorian armor has several issues: Mandalorian Armor Fixes DarthParametric: Your party can be seen in the background of the Taris destruction sequence: Taris Escape Sequence Adjustements 1.1 Two Sith are standing too close in the Taris destruction sequence: Taris Escape Sequence Adjustements 1.1 jc2: The door on the Star Forge that closes the PC in with the droids was bashable: Star Forge Door Fix 1.50 JCarter426: Various Korriban fixes: JC's Korriban: Back in Black for K1 Kainzorus Prime: Focus and proficiency feat icons are switched: [KotOR] Fixed Proficiency/Focus Feat Icons 1.0 Kexikus: Several quests aren't properly ended if you are banned from Manaan: Proper Manaan Quest Endings 1.0 If doing Juhani’s dialog in the wrong order, it was possible to block any further progress The sec﻿ond Xor encounter was impossible﻿ to start if you fi﻿rst meet him and his ﻿goons wit﻿hout Juhan﻿﻿﻿i in the﻿ par﻿ty The second Xor encounter is unavailable on Tatooine LiliArch: Canderous's personal quest is bugged Leilukin: Xor is non-human, while he was human in the XBox version: Human Xor Restoration 1.0 Markus Ramikin: If you've talked with Bastila after kissing her, some dialog isn't available on the Rakatan Temple: Bastila Romance Scriptfix 1.0 On the Star Forge if you haven't talked to Bastila after kissing her, some dialog isn't available: Bastila Romance Scriptfix 1.0 On the Star Forge, if you have denied the romance, the game acts as if you haven't: Bastila Romance Scriptfix 1.0 N-DReW25: Sapith crystal uses wrong icon: Sapith Fix 1.0 First lightsaber crystal uses wrong icon: First Lightsaber Crystal Fix 1.0 Red lightsaber crystal uses wrong icon: Red Lightsaber Crystal Fix 1.0 Vrook and Zhar wear the wrong color robes: Vrook and Zhar Fix 1.0 Two Sith archaeologists are female instead of male: Male Sith Archaeologist Restoration 1.0 Kandon Ark doesn't wear his military suit: Kandon Ark Fix 1.0 Queedle is the wrong race considering several different pieces of dialog: Queedle Fix 1.0 ndix UR: The Ebon Hawk has several holes in its' models: Ebon Hawk K1 Fixes 2.0 R2-X2: Energy shields don't block electricity: Energy Shield Damage Fix Red Hessian: Desert wraids and shyraks use wrong texture: Desert Wraid & Shyrack Texture Fix Thrak Farelle: Droid classes’ feat gain was reversed: Droid Feat Gain Fix 1.0 ZimmMaster: The walking animation doesn't look good: Movement Animation Fix for both KOTOR and TSL 4. Other Recommended Mods: ---------- Scoundrel Trousers JC's Republic Soldier Fix for K1 PC Response Moderation Sith Soldier Texture Restoration JC's Korriban: Back in Black for K1 5. Uninstall: ---------- Given the complexity of this mod, a clean install of KOTOR is recommended. However, you can check through the installation log file if you wish to undo the changes made. 6. Bugs: ---------- These are currently known bugs with KOTOR that I'm working on fixing. If you find any others, please let me know! https://gist.github.com/Mako88/507e8d3b411683388b1e021f0bdabfe0 7. Permissions: ---------- Due to this mod being a compilation from many different authors, please do not distribute it. I do, however, give anyone permission to use the fixes created by me (A Future Pilot) that have been included in the K1CP however they like, with or without credit to me. (Although credit is always nice, y'know?) 8. Credits: ---------- All of the mod authors who have helped make this patch a reality. I can't say it enough - Thank you! Fred Tetra - For creating his awesome KOTOR Tool that makes us modders job a lot easier. Snigaroo - For maintaining awesome mod lists on the /r/kotor subreddit, and for putting up with my many recommendations danil-ch - For the info.rtf template Fair Strides - For bundling up his tools and making them available THIS MODIFICATION IS PROVIDED AS-IS AND IS NOT SUPPORTED BY BIOWARE/OBSIDIAN ENTERTAINMENT OR LUCASARTS OR ANY LICENSERS/SPONSORS OF THE MENTIONED COMPANIES. USE OF THIS MODIFICATION IS AT YOUR OWN RISK AND THE ABOVE MENTIONED COMPANIES OR THE AUTHOR IS NOT RESPONSIBLE FOR ANY DAMAGE CAUSED TO YOUR COMPUTER FOR THE USAGE OF THIS MODIFICATION. 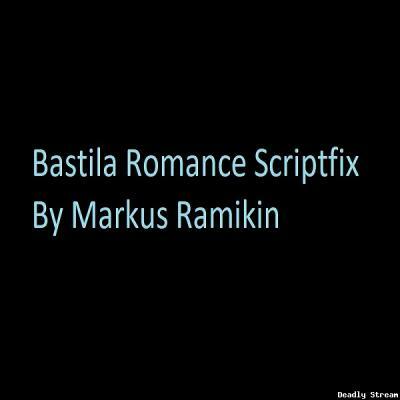 Bastila Romance Scriptfix for Kotor 1 (GOG/retail) by Markus Ramikin version 1.0 I. Description (SPOILERS) After you've kissed Bastila, you can have one more conversation with her about it before the romance gets put on hold "until Malak is defeated". In the original game, two later situations have bugs. First, meeting Bastila on top of the Rakatan Temple: - if you've had that post-kiss conversation with her, the game will not recognize the romance, and you will miss out on certain dialogue options. Second, the final conversation with Bastila on the Star Forge has an opposite problem: - It will fail to recognize the romance if you have NOT done the post-kiss conversation, - If you've sunk the romance completely, for example by saying "Sorry, Bastila, that starship won't fly", the game will mistakenly give you the romance dialogue option. Of course the Kotor 1 community has known for years that Bastila's romance is buggy, and several fixes already exist. But, as far as I can tell, they rely on messing with Bastila's dialogue file (rather than scripts), so 1. they don't fix the second situation, and 2. they don't help a player whose savegame is already past that conversation. This modification fixes both problems by leaving the dialogue file alone, and modifying the scripts instead. It does so by recognizing the following situations: variable state 12: kissed Bastila = romance active variable state 13: kissed Bastila and talked afterwards = romance active variable state 99: romance sunk Now you will get romance-related dialogue options on Rakata and the Star Forge regardless of whether you've discussed the kiss with her afterwards, but you will not get these options if you've shot her down. II. Installation Unzip, copy the files from Override into your game's Override folder. III. Compatibility My fix should be compatible with any mod imaginable - except other fixes/modifications to Bastila's romance, IF they also modify the same scripts I do. K1R, despite including its own Bastila romance fix, doesn't do this, so I'm sure it will work fine with my mod, but I haven't personally tested this. I'd appreciate confirmation. Compatible with existing saves. You can install while on Rakata or even the Star Forge, and it'll work. The mod was tested with the GOG version, and I expect it'll work fine with the old retail/CD versions too. No guarantees about the Steam version at all - if it crashes your game, color me unsurprised. (PSA: Don't get gaming classics from Steam, kids - good old games are the specialty of Good Old Games, duh ) IV. Bugs None that I know of at this time. I've tested it by doing one main playthrough, plus some sanity checks with the Kotor Savegame Editor. So I'm confident it works correctly in all possible combinations of romance state, Revan's gender, etc. In the unlikely case I missed something, though, let me know (and PM me your savegame). V. Disclaimers and permissions. The usual stuff applies. The mod is provided as-is and with no guarantees; by installing it, you accept it may melt your computer, cause nuclear war, and hasten the heat death of the Universe. Distribute freely, as long as you give credit. 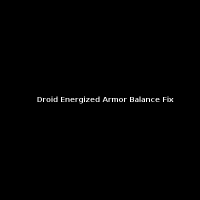 This mod changes the requirements for droids to equip the Energized Armor set. You can find and equip these high level armors before you've levelled your droids, so this changes that so they need the Droid Upgrade Class 3 feat (level 13). Use it however you like, just mention me when doing so. 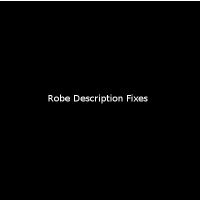 Fixes all robes that weren't marked as upgradeable in their description. Should work universally with TSLRCM, M478-EP and Vanilla TSL. Use it however you want, as usual just throw a mention my way. Note that this mod is not compatible with 90SK's TSL Loot & Immersion Upgrade 2.0.7b, as well anything else it would overwrite. Though it won't break anything so long as you choose not to overwrite. 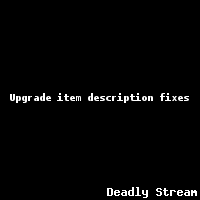 Fixes to different upgrade items that had problems with their descriptions. My first released mod, thought I'd get it out there instead of on disk and give back to the community. This version adds a fix for the Ostrine edge not showing it's usage requirements and a return carriage for the Solari Crystal. Suggestions welcome. Use it however you like, just throw a mention my way. Fixes a few missed script parameters. Makes Mical's "medic" dialogue available once you learn that he has medical training. Force Fashion II compatible files included. 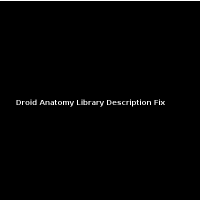 Corrects the Droid Anatomy Library not showing it's +1-10 Energy Damage vs Humans. Use it however you want, just throw a mention my way. Should be considered somewhat a beta release as it's untested, I only added a description and verified it can now be seen in game.